INTRODUCTION: Mental health workers who listen to stories of fear, pain and distress of traumatised clients may develop deleterious emotional, cognitive and physical consequences (Cairns, 2007). This phenomenon has been called secondary traumatic stress (STS) (Perez, Jones, Englert, & Sachau, 2010). Rwanda is well-known for the 1994 genocide, with the death of hundreds of thousands of people in a planned campaign of violence. Numerous mental health workers operating in Rwanda were also victims of the violence and it has been suggested that there is a high level of STS in mental health workers in Rwanda (Iyamuremye & Brysiewicz, 2008). AIM: To develop a comprehensive model to manage the effects of STS in mental health workers operating in Rwanda. METHOD: An action research project was initiated to develop this model and data for the model was collected through individual interviews with mental health workers (nurses, doctors, psychologists, trauma counsellors and social workers) as well as a quantitative tool measuring secondary traumatic stress (Trauma Attachment Belief Scale) in these health workers. 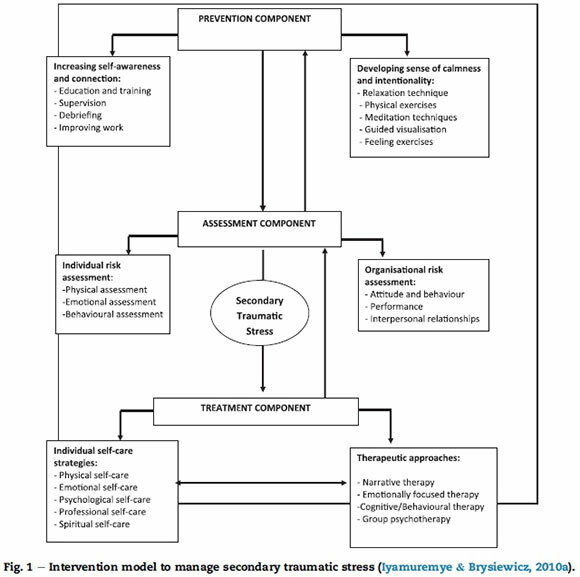 RESULTS: The Intervention Model to Manage Secondary Traumatic Stress (IMMSTS) was synthesised from these findings and includes preventive, evaluative and curative strategies to manage STS in mental health workers in Rwanda at the individual, social and organisational levels. CONCLUSION: The model will offer mental health professionals an effective framework for addressing the issue of STS. Rwanda is known throughout the world for the 1994 genocide where up to one million people were massacred during the 100-day genocide against the Tutsi. The recovery process has presented huge national and personal challenges for survivors (Schaal & Elbert, 2006). During the genocide, Rwandan women were subjected to sexual violence on a massive scale committed by elements of the notorious Hutu militia groups, well-known as the Interahamwe (Mukamana & Brysiewicz, 2008). Mental health workers who listen to these stories of fear, pain and distress of traumatised clients may develop their own deleterious emotional, cognitive and physical consequences (Cairns, 2007). This phenomenon has been called STS (Perez et al., 2010). Since numerous mental health workers operating in Rwanda are themselves victims of trauma, it is imperative to ensure that appropriate psychological support services are developed to help them deal with STS. A pilot study showed that there was a high level of STS in mental health workers in Rwanda which warranted further intervention (Iyamuremye & Brysiewicz, 2008). The emotional consequences of working with trauma-tised individuals are visible in diverse ways, namely STS (Stoesen, 2007), compassion fatigue (Bride, Radey, & Figley, 2007) and vicarious traumatisation (Pearlman & McKay, 2008). Mental health workers may feel negative changes in their professional functioning, self and worldviews, sense of security, self-capacities and psychological needs as a result of indirect exposure to STS (Shah, Garland, & Katz, 2007). The impact of STS on mental health workers in Rwanda and the insufficient support system need to be investigated, as mental health workers who are overburdened with work, stress and their own traumas have few resources left to care for and comfort others (Iyamuremye & Brysiewicz, 2008). Unfortunately, most mental health workers are unaware of the nature and extent of STS, lack access to supportive resources and have little or no training about how to recognise symptoms in themselves and others, or how to respond to the resulting distress (Satkunanayagam, Tunariu, & Tribe, 2010). Although attention has been paid to the process of healing primary victims of trauma (Bicknell-Hentges & Lynch, 2009), an enquiry into the therapeutic practice of mental health workers helping traumatised patients shows that very little has been done to manage the trauma of secondary victims. The aim of this study was to develop a comprehensive model which integrated primary, secondary and tertiary interventions in managing the effects of STS in mental health workers operating in Rwanda. to remain true to the mutually collaborative action research approach (Koshy, 2010) and ensured that health professionals were encouraged to be actively involved in the change process. At the beginning of the study, a research team consisting of experts in mental health care was established in keeping with the mutually collaborative action research approach. Inclusion criteria were that they had to hold either a qualification as a medical doctor, psychiatrist, psychologist, mental health nurse, social worker or trauma counsellor and expressed interest in being involved in the project. The research team members who guided the entire research process were involved in all aspects of the planning and implementation of the project. It was anticipated that once the research was completed, they would take a leading role in continuing the process of implementing the newly developed IMMSTS and leading the possible change in practice. The research study comprised four cycles. Cycle 1 was the establishment of the research team and collection of quantitative descriptive data measuring the extent of STS using the Trauma Attachment Belief Scale (Pearlman, 2003). The results from this cycle then informed the questioning in Cycle 2 with the collection of qualitative data through individual interviews with mental health workers including nurses, doctors, psychologists, trauma counsellors and social workers regarding their experiences of STS (Iyamuremye & Brysiewicz, 2012). A summary of the main findings from these two cycles are presented in Box 1. Cycle 3 was an amalgamation of the findings from Cycle 1 and 2, as well as relevant literature, to develop the IMMSTS (see Fig. 1); this process was guided by Taylor-Powell and Henert (2008). The key elements included in the IMMSTS were preventive, evaluative and curative strategies to manage STS in mental health workers in Rwanda. In the process of generating the model, the research team started by describing what the model was trying to represent and to identify and describe the concepts active in the domain of STS management and then analyse them in terms of the phenomenon of interest. The research team also attempted to develop a visual representation of the IMMSTS. They attempted to use the idea of an algorithm as a way of visually presenting the IMMSTS because in the mental health practice staff are familiar with the use of algorithms. Cycle 4 was the implementation of the IMMSTS. After each cycle the research team reflected on the data obtained in the previous cycle and planned and refined the following cycle. Permission to carry out the study was obtained prior to the initiation of data collection from the authorities of mental health services in Rwanda and the research committee of the University of KwaZulu-Natal, South Africa (the researcher was a student). Written consent was given by the participants; anonymity and confidentiality were maintained. Owing to the sensitive nature of the subject matter being discussed, the researchers were aware of the need to provide psychological support should it be necessary, and they had the appropriate skills to do so. The issue of ownership of the data and the research team members' role in the study was negotiated at the beginning of the study. The participants in the research study decided that in order for the model to be useful, the following assumptions had to be made. Since most Rwandans had personally experienced major losses or life-shattering events in the 1994 genocide, mental health workers in Rwanda are vulnerable to STS and its effects. Often mental health workers do not realise that they are suffering from STS until it is too late and they are already affected. The effects of STS can be serious, devastating and everlasting. The IMMSTS has three major components, namely 1) providing STS preventive interventions; 2) providing STS risk assessment interventions; and 3) treatment component providing curative care and STS management/treatment interventions for mental health workers. These components originated from the quantitative findings of cycle 1, the qualitative data of cycle 2 and the relevant supporting literature. Each concept was evaluated based on whether it seemed relevant to the management of secondary traumatic stress and whether it seemed useable when presented to participants. The IMMSTS illustrates directional relationships and these are indicated by uni-directional arrows going from the variable to another variable on which it is thought to exert its influence (see Fig. 1). supervision and debriefing, and improving work conditions by providing adequate communication and ensuring adequate resources and support systems (Hanna & Romana, 2007). The second involves developing a sense of calmness and intentionality by means of personal and professional strategies which encourage relaxation techniques, physical activities, meditation techniques, guided visualisation and feeling exercises. When it's really bad I just shut off completely from everything I do, I just kind of retreat into myself and I don't really feel anything. I don't socialise, I don't do anything, I just kind of sit and try and work through it on my own. Some activities such as education, supervision, meditation, relaxation, debriefing and improving the work environment are necessary to increase self-awareness and connection in mental health workers. When I am having a bad day all I need to do is walk through the garden outside the service, and see the flowers. My heart sings again with their courage and Ifeel lucky and happy to be me. Sometimes after a session with a client, I will be traumatised ... I will feel overwhelmed, and I can remember a particular situation with a traumatised client where I just didn't want to hear any more of her stories about what actually happened. The client seemed to want to continue to tell me these [stories] over and over and I remember justfeeling almost contaminated, like, you know, like I was myselftraumatised. You know? Risk assessment strategies can focus on either the individual or the organisation. I'm stressed all the time when I arrive at my work. My thing is not having enough time to spend with each patient. I think that is what gets me. And then when I get home, it's like, "Did I do right by that patient?" It may be one particular patient that was sick and it just spins offfor the rest ofthe day. I feel more tired out ofamount to the work that I have done ifit has been a really bad day. I feel particularly exhausted ifI have had numerous negative encounters, be it staffmembers or patients. Sometimes it feels like you are in it all by yourself. and you are trying to wade through mud and sinking fast. The work environment is sometimes more traumatic on [to your] mental health than the traumatic stories we hear about . and then unfortunately it takes your attitude of what has been happening at work ... you take it home and you find that at home, you are not the person who you know yourself to be. You are short-tempered, you are agitated, you are irritated, you become aggressive yourselfat home. Sometimes it gets so busy that I don't have the time to take a moment to calm myself and when I go to the next patient Ifeel like I get mad at them for being sick, for being there. It doesn't matter to me why they are here - the stress has gotten to me. The excessive number of patients in the mental health service caused by increased acuity and lack ofmental health staffmade me feeling as if there is too little to fill all of the gaps. It would be nice to have a guideline to give you ideas on what to do and how to do [it] during stressful case. I have found that while working in mental health service I constantly have to take the time in order to take care ofmyself. I do this by enjoying time with friends, watching kids play in the park. I also take the time out to play and have vacations from here. Without this balance, I think it would be very easy to develop secondary traumatic stress and that I have to hide away in order to protect myself. Suggestions for reducing the effects of STS include adherence to a therapy contract with clear goals, rules and boundaries, specialised training to raise awareness and recognition of STS (Goldblatt, 2009). Therapeutic approaches to manage STS include narrative therapy, emotional focused therapeutic approaches, cognitive behavioural therapies, and group therapy (Osofsky, Putnam, & Lederman, 2008). It just sort of comes when you least expect it, you'll suddenly start thinking [about an event]... and all of the thoughts andfeelings that you had at that time ... If we say we would like counselling, you know, I feel we should get it within a week of asking. Not two to three months down the line, and it has gone . when we dealt with it. We want it when we ask for it. The developed IMMSTS was implemented in one mental health service and the implementation of the model was evaluated after six weeks. A participatory approach was used to implement the developed model and after initial hesitance regarding the model, the mental health workers moved towards a shared view of what should be changed in managing secondary traumatic stress in mental health workers. They also tried to use the different interventions stipulated in the model and discussed the practicability of these interventions in the services. After the implementation cycle the participants were asked to evaluate the implementation of the model according to the objectives of the study. The data was collected in a workshop held with mental health workers, managers and research team members where they were asked whether they felt the model had been worthwhile and whether there had been any change in their attitude. During this evaluation process the mental health professionals reported that they had already started to notice a change in coping with their stress when working with traumatised clients or other psychiatric patients. By the end of the research study, a number of the participants initiated discussions with the researcher regarding STS and there appeared to be a greater acceptance of the reality of STS in Rwanda. The participants also said that the research had changed what they thought was important when managing their work-related stress and had also highlighted their own weaknesses as well as weaknesses in the mental health service. Some of the research team members proudly described how the IMMSTS had "worked" and how it contained all the information needed to manage STS in their institutions. This intervention model may thus serve as a frame of reference to facilitate and assist mental health workers who experience STS and hopefully increase awareness of the implication of STS. One limitation of the study was that it could not be generalised as the study was only carried out in mental health services situated in Kigali City. The fact that the IMMSTS was implemented in one mental health service during a six-week period may also have restricted the impact of the IMMSTS. The usefulness and efficacy of this IMMSTS, as well as its possible use in settings other than mental health services, warrants further research. There is a need to evaluate this intervention model to manage STS in mental health workers in Rwanda with a view to replicating the study on a large scale within the country and in the East African region. In order to see how sustainable the model is over time, these interventions need to be translated into active ongoing coping activities to be conducted at the individual, group and organisational levels. Organisational responses, such as creating an organisational culture that acknowledges the potential for secondary traumatic stress, may help mental health workers to deal with secondary traumatic stress. The model to manage STS is an essential component in rendering effective mental health care to traumatised clients and other psychiatric patients. The model can offer mental health professionals an effective framework for addressing the issue of STS. The implementation of the model needs a commitment by all role players in the mental health sector operating in Rwanda. Numerous mental health workers operating in Rwanda were also victims of trauma; it is thus imperative to ensure that appropriate psychological support services are developed to assist them to deal with their secondary traumatic stress. The study was conceptualised, carried out and analysed by both authors. J.D.I physically collected data and PB was the research supervisor. Both authors drafted the manuscript. * Corresponding author. Tel. : +27 31 2601281, +27 837855069 (mobile). E-mail addresses: iyadamas@gmail.com (J.D. Iyamuremye), brysiewiczp@ukzn.ac.za (P. Brysiewicz). 1 Tel. : +250 782299718, 1+250 782299718.